London Mayor Ken Livingstone has called for a halt in the spread of "wasteful" patio heaters. Although he has no powers to regulate their numbers, the mayor urged retailers not to promote them. "We need to call a halt towards this trend for wasting energy in this way," Mr Livingstone said. The Green Party has claimed London could see its carbon dioxide (CO2) emissions surge due to the extra patio heaters installed for the smoking ban. Mr Livingstone said: "Cutting out wasteful use of energy is the most important way in which we can cut emissions in the short term. "We need to call a halt towards this trend for wasting energy in this way. "I hope garden centres and other retail outlets will reconsider the promotion of these patio heaters." London Assembly Greens said the city's CO2 output could increase by more than 20,000 tonnes a year when the ban comes in on 1 July. Darren Johnson, a Green Party member of the London Assembly, said: "Outdoor heaters are an extraordinary waste of energy and carbon emissions. "As well as heating outdoor space they also warm the climate. Each patio heater generates 2.2 tonnes of carbon dioxide on average per year, the equivalent to driving a car for over 6,000 miles. "For the sake of the climate, I urge pub and café owners to kick the patio heater habit." But Simon Clark, from smokers' group Forest, said any notion of banning patio heaters was "barking mad". He said the move smacked of "petty vindictiveness" towards smokers. "Is it that they simply do not like the idea that smokers might be moderately comfortable smoking outdoors?" he said. 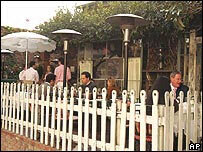 He added the damage to the environment from patio heaters was "minuscule" in terms of the overall effect.